Swansea caretaker boss Alan Curtis says whoever takes over as manager would "be delighted with the team he's going to inherit" in the wake of their 2-1 defeat at Manchester City. Bafetimbi Gomis drew Swans level only for Kelechi Iheanacho's injury-time deflection to deny them a draw. Curtis says Swansea can "absolutely" avoid relegation even though they lie one point above the relegation zone. "We've got 100% belief that we can get out of trouble," said Curtis. Gus Poyet is "interested" in succeeding Garry Monk, who departed after one win in 11 games. Defeat at Etihad Stadium came despite what Curtis described as a performance Swansea can be proud of. 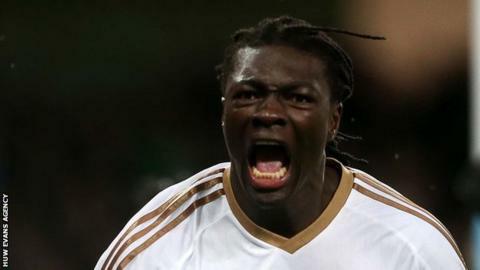 He now wants to see Gomis and his team-mates continue in a similar vein, with Swansea's lack of goals this season "part of the problem" that led to Monk leaving. "We've been struggling, obviously, but as I was telling the players after the game, that's the standard we have to set between now and the end of the season. "And if we can do that, we've shown everyone today what a good team we still can be. "Gomis has shown the qualities he has got and I thought it was a terrific finish. He's shown what he can do and he has to repeat that between now and the end of the season." Curtis felt Swansea deserved more out of the game. "When we equalised just before the end, I thought we were going to hang in there," he added. "I think overall we did create more chances, but I guess that's the difference between [top] teams and teams at the bottom."